^ 1.0 1.1 Edward Robert Harrison. Masks of the Universe. Cambridge University Press. 2003: 206. ISBN 0521773512. ^ 2.0 2.1 For a discussion of why objects can be seen that are outside the Hubble sphere, see TM Davis & CH Linewater. 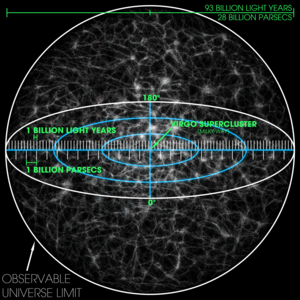 Expanding Confusion: common misconceptions of cosmological horizons and the superluminal expansion of the universe. 2003. arXiv:astro-ph/0310808. ^ For an example of mistaken usage, see Max Tegmark. Parallel Universes. (编) Barrow, J. D.; Davies, J. D.; Harper, C. L. Science and Ultimate Reality: From Quantum to Cosmos. Cambridge University Press. 2004: 459ff. ISBN 052183113X. ^ Edward Robert Harrison. Masks of the Universe. Cambridge University Press. 2000: 439. ISBN 052166148X.